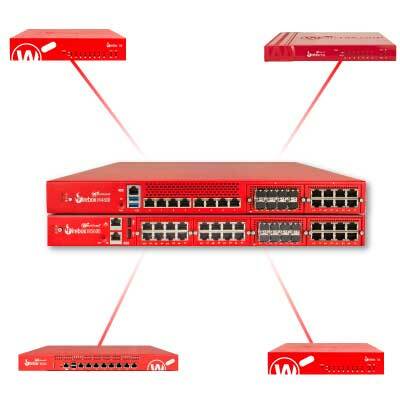 WatchGuard Firebox M4600 provides firewall speeds up to 40 Gbps. Optional network interface modules, including 4x10 Gb Fibre, 8x1 Gb Fibre, and 8x1 Gb Copper enable flexible custom configurations. Hot-swappable redundant power supplies are standard, ensuring maximum uptime. WatchGuard Dimension is standard on M4600 appliances, bringing big data visibility to all security events and network activity without complexity. Standard Support provides hardware warranty with advance hardware replacement, technical support, software updates, and concise threat alerts. The Firebox M4600 allow businesses to add the network interface modules that best suit their environment. Typically deployed at the corporate headquarters, these appliances serve as the “hub” appliance, responsible for managing and securing all communications between the head office and all remote employee and small business sites. WatchGuard Dimension, which is included at no additional cost, provides a suite of big data visibility and reporting tools that instantly identify and distill key network security threats, issues and trends, accelerating the ability to set meaningful security policies across the entire network. Every network needs a full arsenal of scanning engines to protect against spyware, viruses, malicious apps, data leakage, botnets and more. WatchGuard’s award-winning network security platform not only provides the most complete suite of unified security controls on the market today, but we have consistently been the first to offer solutions for addressing new and evolving network threats including ransomware and advanced malware. Uniquely architected to be the industry’s smartest, fastest, and most effective network security products, WatchGuard solutions deliver in-depth defenses against advanced malware, ransomware, botnets, trojans, viruses, drive-by downloads, data loss, phishing and much more. Total and Basic Security Suite packages are available on all Firebox solutions.